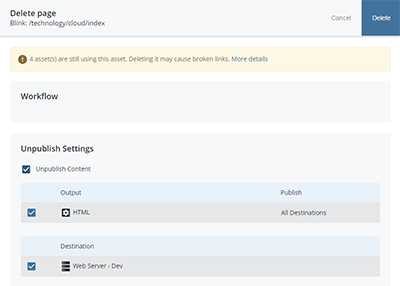 Learn how to delete assets within the CMS. Instead of deleting published pages, you can archive them. This lets you save them in the CMS so you can refer back to them later, and even bring them back to the live site if needed. To archive a page, move it to the /_archive folder which has had publishing disabled. Feel free to delete draft pages. When you archive pages it will create broken links to any pages linking them then (even internal links). Use the Relationships feature to find which pages in your site need to have these links removed. Blink users, do not move or archive pages. Send your request to Workplace Technology Services. If you accidentally delete an asset, it is possible to recover it. Navigate to the asset you want to delete. The Delete page screen will pop-up. You can see if there are any other assets in the site that are linking to this page. If there are assets linking to the page you want to delete, click More details to see what they are. 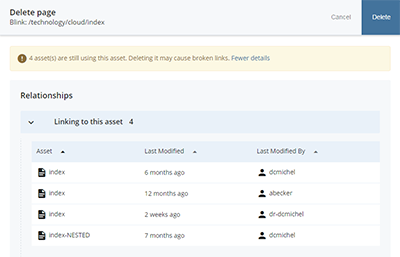 Expand the Linking to this asset drawer. Deleting the current page will create broken links from each of the listed assets. Before you delete this page, navigate to those pages (you can click on their names to link to them) and remove the link(s) to the soon to be deleted page. 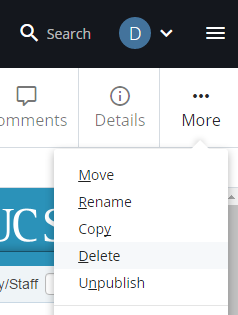 Note: There may still be UC San Diego pages outside your specific site linking to your deleted content. When you have removed links to the page you want to delete, make sure Unpublish Content is checked.